Attorney Vincent W. Oswecki grew up in Windsor and attended Windsor High School, where he graduated first in his class. Vincent received his Bachelor’s Degree from Trinity College in 1965, and his Juris Doctor Degree from Georgetown University Law School in 1968. He was admitted to the Connecticut Bar in 1968, and to the United States Supreme Court Bar in 1975. Vincent has been extremely active in the community, and has worked on many boards, committees, and government agencies throughout his career. He was the Vice Chairman of the Windsor Board of Education from 1970 to 1973, a member of the Hartford Hospital Board of Directors from 1975 to 1980, the Commissioner of the Metropolitan District Commission from 1989 to 1995, and Attorney for the Granby Redevelopment Agency from 1982 to 1986. Upon appointment by former Governor Grasso, Vincent was Chairman of the Bradley International Airport Noise Abatement Committee from 1973 to 1983. 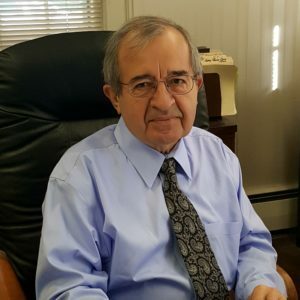 Additionally, Vincent was the Town Attorney for Granby, Connecticut from 1977 to 1982, and has represented the Town of Windsor continually since 1969. He is currently a member of the Hartford County and Connecticut Bar Associations, the Connecticut Association of Municipal Attorneys, and the Connecticut Trial Lawyers Association. Vincent has been an attorney with the Firm since 1968. His primary practice areas include estate planning, elder law, wills & trusts, probate proceedings, and the representation of buyers and sellers in real estate closings.